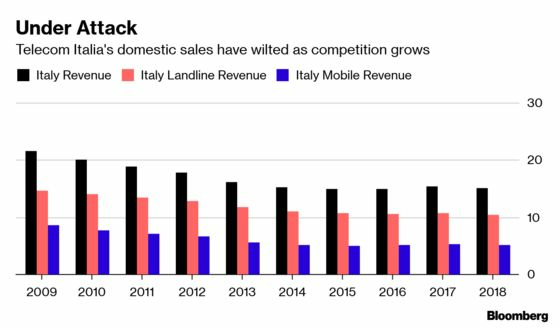 (Bloomberg) -- Vivendi SA abandoned an attempt to win back control of Telecom Italia SpA from allies of activist hedge fund Elliott Management Corp., signaling an end to a boardroom battle that has delayed an overhaul of the struggling phone company. Vivendi gave its support to Elliott-backed Chief Executive Officer Luigi Gubitosi at Telecom Italia’s annual shareholder meeting near Milan on Friday and withdrew a proposal to replace five directors aligned with the hedge fund after it became clear Vivendi would lose the vote. The French media company, which holds almost a quarter of Telecom Italia’s shares, has been fighting to regain the upper hand after Elliott muscled it aside last May with a demand for a more radical restructuring of the company including a spinoff of its fixed-line network. "This outcome is a victory for the company and paves the way for stability and sustained value creation for all of TIM’s stakeholders," Elliott said in a statement. Telecom Italia stock rose as much as 4.6 percent, their biggest intraday gain in six weeks, and closed up 2.5 percent in Milan. Vivendi’s controlling shareholder Vincent Bollore has been sparring with the activist fund run by Paul Singer for more than a year, destabilizing management and delaying efforts to revive the former monopoly, whose shares have lost half of their value in three years. The carrier has struggled for years with shrinking revenue in its home market and hasn’t paid a dividend on its common shares since 2013. Its dominant landline network has been in steady decline as consumers opt for wireless connections instead and it now faces competition from French discount operator Iliad SA. 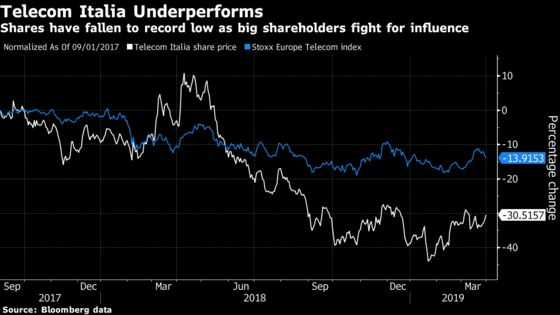 Telecom Italia’s CEO Gubitosi last month wrote down the value of Telecom Italia’s assets by 2.6 billion euros ($2.92 billion). Vivendi saw Telecom Italia as part of a potential southern European telecom and media powerhouse to rival U.S. giants such as Comcast Corp. and Netflix Inc. Elliott is more focused on cost cuts and asset sales to jolt the share price. Vivendi’s decision was announced early in the meeting by its head of legal affairs, Caroline Le Masne de Chermont, shortly after Gubitosi called upon shareholders and management to put aside divisions and focus on executing the company’s business plan. State lender Cassa Depositi e Prestiti was trying to broker a settlement between the parties ahead of the shareholder meeting, according to people familiar with the matter. One proposal would have seen Telecom Italia Chairman Fulvio Conti, who was elected to the board last May on Elliott’s slate, replaced by a CDP representative, said two people with knowledge of the situation. Elliott’s statement on Friday conveyed little appetite for compromise. It said Vivendi’s decision to withdraw its request was “a clear sign” that it realized there was broad support for the existing board. The rivals ratcheted up the hostile rhetoric in recent weeks. Elliott published a 40-page presentation defending its plan for the company, raising concerns about Vivendi’s history steering the carrier and attacking Bollore’s corporate governance and business track record. Vivendi accused Elliott of organizing shadow board meetings at Telecom Italia, flouting market rules on sharing sensitive information and buying financial instruments that left it with interests in Telecom Italia that were out of step with those of other shareholders.